I'm new here... and so is my purchase of my 1st M1 Carbine. It says Underwood 1-44 on the barrel... Serial number is 2186*** with US Carbine cal 30 stamped above the chamber. I tried to post photos so since this is my 1st attempt... we'll see. Anyone have any idea what it's worth? 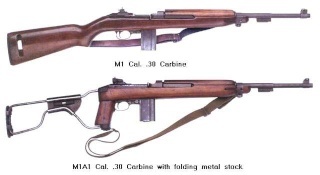 If you don't mind my asking, what do M1 Carbines sell for in NZ? In the US, the prices are all over the place, you may pay as little as $300 to $400 for an "import" carbine in OK shape. You can also spend several thousand on a very nice carbine that some how evaded the US Government improvements such as type 3 rear sight staked in place and type 3 barrel band & bayonette lug. I am just curious and of course there is a different currency in play.